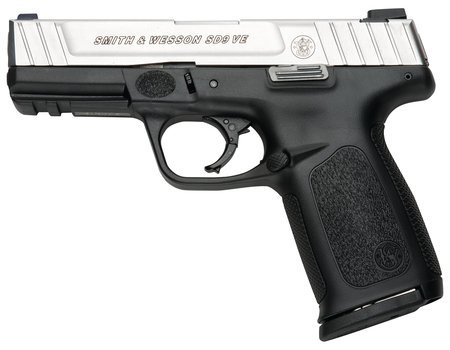 S&W Model SD9 VE 9mm 4 Inch Barrel Two-Tone Finish 3-Dot Sights Self Defense Trigger 16 Round. SDT- Self Defense Trigger for optimal consistent pull first round to last. Striker fired action. Stainless steel barrel and slide. Standard Picatinny style rail. Polymer frame. Slim ergonomic textured grip with aggressive front and back strap texturing. Textured finger locator.